Portencross (NS 175 488) is at Farland Head which projects into the Clyde Estuary just south of the Cumbrae Islands. At the cross roads on A78 on the northern edge of Seamill, take B7048 west for 2km to the road end where there is a large free car park and seaside picnic place with panoramic views of the Clyde. The historic Castle and port lie close by. A track for use on foot or cycle follows the shoreline north for 2km to the BNFL nuclear power station. This coastal walk or cycle can be extended to a very attractive and level 10km round trip past rocky shoreline, mud flat, scrub, marsh, cliff face, mature woodland and pastoral and arable farmland. The route, which is described below, is mainly on off road tracks and way-marked cycleways. Please respect any requirements from the power station operators by whose property the route passes at one stage. Adequate parking. Very rough track beyond locked gate at end of public road (NS 176 490). Easy link to the Ardrossan to Largs coastal cycle path. Easy 10km round cycle on tracks and quiet byways. 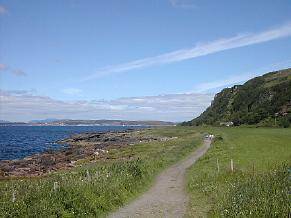 The path from Portencross runs along a raised beach though meadow backed by a steep escarpment whose lower reaches are heavily wooded. The shoreline is rocky at this stage. Sea viewing can be rewarding. Black Guillemot and other seabirds favour the projecting power station service pier. Stonechat, Whitethroat and Sedge Warbler inhabit the scrub and the escarpment has breeding Fulmar and Buzzard . The woodland attracts summer visiting warblers such as Blackcap and Chiffchaff . Raven, Great Spotted Woodpecker, Tawny and Barn Owl are in the area. The range of birds seen can be extended by following the circular route. Portencross (also known under many variants of that name) was once a harbour of some importance. Arnele Castle (and its successor Portencross Castle) was the focal point of this harbour and hamlet at Farland Head, overlooking the Firth of Clyde. Rich in history, Portencross is reputed to have been the last mainland resting place for bodies of the former Scottish Kings from Kenneth MacAlpine to Malcolm Canmore, before they were ferried to the island of Iona for burial. The present Castle was built in the reign of Robert II, 1371 to 1390. The castle’s roof blew off during a violent storm in 1739, but its walls remain intact. Four storeys high, the interior features a barrel-vaulted ceiling. It boasted two kitchens on the first two floors, and from the first floor, a circular staircase leads to the top. The L-shaped plan of Portencross castle is the first of these early buildings in that form. Abandoned, it remains remarkably intact despite an absence of urgently required maintenance. Update 2010: As a result of a successful fund-raising campaign, the castle has been extensively restored. It is now open to the public during selected periods in the warmer months. From the style or gate at the northern end of the raised beach path, continue along a well-made road past the power station complex for 2.5km round to where the way-marked coastal cycleway crosses. There are wetlands within the BNFL site, a haunting natural setting for the impressive reactor buildings in the background. 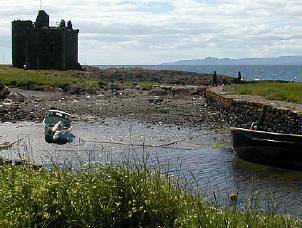 A bubbling outflow and mudflats lie to seaward with seascapes past Great Cumbrae and Largs to the mountains beyond. Turn south along the cycle route towards Seamill and follow it as it weaves along tracks and byways through mature woodland and pastoral and arable farmland. Rejoin the B7048 just 1km from its terminal car park. Allow hours for walking and 1 for cycling – plus birding! This entry was posted in Locations - North Ayrshire on 23-Jan-2003 .